I absolutely love coconut milk. I don’t have a dairy allergy but I love using coconut milk and almond milk in my protein and green smoothies. They are a healthier choice and easier to digest, at least in my experience. I used to buy almond and coconut milk at the store but never liked all the additives or even the flavor that much. After learning to make my own homemade coconut milk, it’s hard to go back. 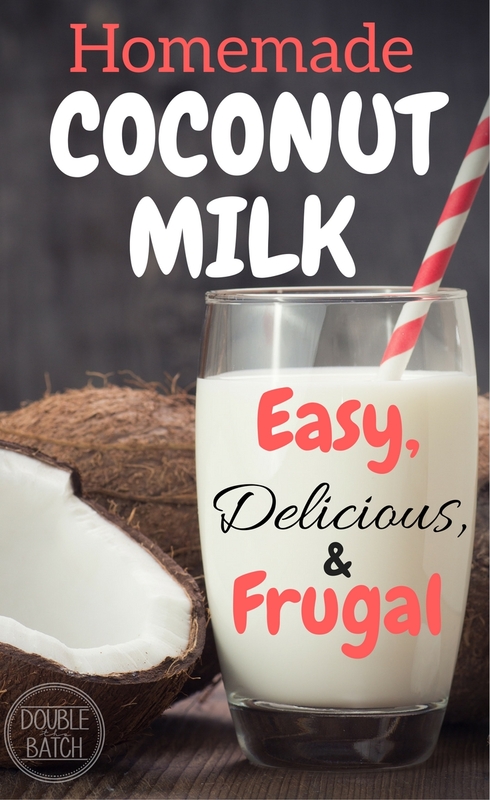 Not only does homemade coconut milk taste better, it’s fresher and you can adjust the flavor yourself! Not only that, but you don’t have to take up a ton of your fridge space with all those cartons. Just make up a new batch when you need it. It literally took me about 10 minutes today to make 2 quarts of coconut milk. That will last me for 4-5 days of protein smoothies (if my kids don’t drink it, which they will) All you need for basic Coconut Milk are 2 ingredients: Coconut and water! After that, it’s up to you if you want to add more. Blend for 1-2 minutes if you have a high-powered blender like a Vitamix or a Blendtec. Otherwise, you will need to blend a couple minutes longer. You will need to strain out the coconut pulp next. You can use cheesecloth or a fine mesh strainer. I prefer this Nut Milk Bag because it is FAST and easy to clean after. Store in a container (I use a mason jar) in the fridge. It will keep for 4-5 days. The coconut fat will rise to the top but only requires a quick shake before you pour. 4 Worries as a Parent, That you Really Shouldn’t Worry About!